Dhaka, Dec 16 (Just News): The nation celebrated the 47th Victory Day today with due solemnity remembering with gratitude millions of martyrs who made supreme sacrifices to liberate the country from the clutches of the Pakistan occupation forces fighting successfully a nine-month-old war in 1971. Braving a chilly weather in the morning, thousands of people from all walks of life thronged the National Memorial at Savar to pay their glowing tributes to the worthy sons of the soil. Carrying banners, wreaths, follower petals and wearing head bands inscribed with the slogans of the Victory Day, thousands of people from all strata converged near the National Memorial since dawn. The day was heralded with a 31-gun salute at the National Parade Square at dawn. Other programmes of the day included hoisting of the national flag on top of all national and private institutions, placing of wreaths at the National Memorial at Savar, decorating the road-islands tastefully, discussions, cultural soirees, rendering of the National Anthem by millions of people and illumination at night. Besides, special prayers were offered at all the places of worships across the country for eternal peace of the souls of the martyrs of the Liberation War. President Abdul Hamid and Prime Minister Sheikh Hasina paid rich tributes to the martyrs of Liberation War by placing wreaths at the National Memorial at Savar this morning. After placing the wreath, they stood in solemn silence for some time as a mark of respect to the memories of the martyrs of the Great War of Liberation of 1971. Members of the cabinet, advisers to the prime minister, parliament members and chiefs of the three services, diplomats and high civil and military officials were present on the occasion. Flanked by senior leaders of the party, Sheikh Hasina, also the Awami League president, laid another wreath at the National Memorial as the party chief. Agriculture Minister Matia Chowdhury, Industries Minister Amir Hossain Amu, Road Transports and Bridges Minister and Awami League general secretary Obaidul Quader, Food Minister Advocate Quamrul Islam, and senior party leaders Sahara Khatun, Abdur Razzak, Jahangir Kabir Nanak, Dr Hasan Mahmud and Abdus Sobhan Golap, among others, were present, among others, were present on the occasion. Prime Minister Sheikh Hasina paid rich tributes to the Father of the Nation Bangabandhu Sheikh Mujibur Rahman on the occasion of the 47th Victory Day. The premier paid the homage by placing a wreath at the portrait of Bangabandhu in front of Bangabandhu Memorial Museum at Dhanmondi here this morning. Meanwhile, the Prime Minister today released the memorial postal stamp of Taka 10 denomination and its first day cover issued by Bangladesh Postal Department, marking the 47th Victory Day. An attractive Victory Day Parade to celebrate the 46th anniversary of the country's victory was held in the city today. Different contingents of Bangladesh Army, Navy and Air Force as well as Freedom Fighters' contingent, Para-military forces, law enforcement agencies and various ministries of the government participated in the parade held at the National Parade Square. President Abdul Hamid was present as the chief guest and took salute of the parade held under the auspices of the 9th Infantry Division of Bangladesh Army at Savar at the directives of Ministry of Liberation War Affairs and supervision of the armed forces. The President accompanied by parade commander Major General Md. Akbar Hossain, riding on an open jeep visited the Victory Day Parade and took salute. Prime Minister Sheikh Hasina attended the parade and enjoyed the attractive march past, spectacular fly-past, aerobatic display and armoury acquisitions of different regiments and contingents of the armed forces. Thousands of people from all walks of life witnessed the spectacular two- hour parade. 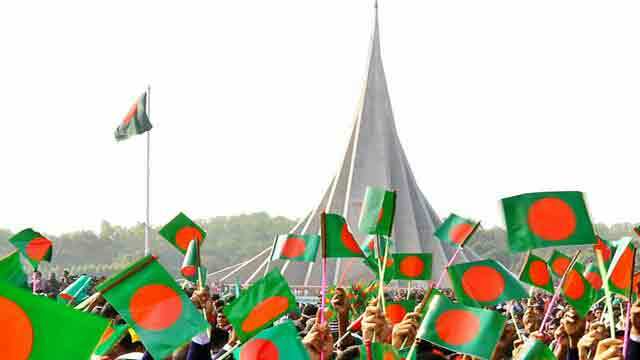 The Victory Day was also celebrated in Bangladesh missions abroad with due solemnity commemorating the supreme sacrifice of millions of people. The day's programmes were begun following hoisting of Bangladesh National Flag at Bangladesh missions abroad, according to messages received here today.